I would like to just give a little prologue before the days of my memory, that is, say from 1900-1920, very briefly what the situation was. Then I'd like to talk about the rural areas and talk about Enderby, which I knew, as I went to high school here, talk about what we did have in those days, and then about the things we didn't have and then talk about the two things we did have. Enderby was a flourishing community from the late 1890s, around 1900, up to, possibly, 1915 or so. It had a large flour mill here, the Moffet Flour Mill. It had one of the largest sawmills in the interior of B.C., probably as big as any unless the one at Chase was larger, I couldn't say which would be the larger of the two. 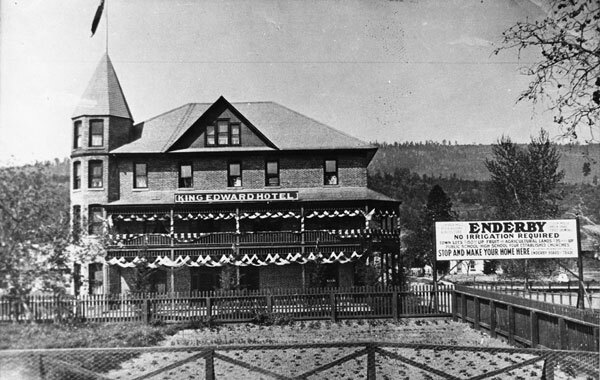 It had two hotels at that time: the King Edward, which you see here, the brick hotel; it had a large wooden hotel with which was older than the King Edward on the site where the forestry station has been for the past number of years. It had a drug store. It had several grocery stores. The one that I remember best was run by the Dill Brothers. It was near where, I think the stage stop is now on Cliff St. Beside it was a garage, run by Mr. Morris, a Belgian gentleman. It had, at that time, a skating arena and it had a curling rink, one of the few amenities it had at that time. I remember when they used to go to play the Salmon Arm, they played on McGuire Lake, had lights over at night, because Salmon Arm didn't have a curling rink, but Enderby did. That was largely due to a man who ran a store here for a long time, Mr. Speers, who died not too long ago at a very elderly age. Enderby became a city in 1905 because at that time it was a thriving community with a very large sawmill and the flour mill. Because it became a city, it was not like the rural communities around. Ashton Creek developed a community hall. Grindrod had a community hall which later burned down. Hullcar had a community hall. But Enderby was a city, it had an Opera House. I don't think there was ever an opera in it, as far as I can remember, but they had an opera house. It housed dances and parties the same as the community halls did, but they wouldn't have dared call it a community hall. So much for the physical facilities, those are probably the main things that existed at that time. But, when the flour mill closed down, and when the sawmill ceased to operate (there have since been small mills), Enderby went into decline. For 25 years, there wasn't a house built in Enderby. From the time that the sawmill closed down, right through the Depression of the late '20s and the early '30's, and Billy Blackburn built a house on the north side of town, about a quarter of a mile out of town, 25 years after the last house was built. So there was a great decline. Then in the last few years, Enderby has expanded quite considerably. The country side was somewhat different because it didn't have this large sawmill, it didn't have a flour mill, it didn't have electricity. Enderby did. Enderby had its own powerhouse with an old diesel engine with a great big metal ball on it, and the engineer had to get there an hour early and put a blow torch on it for an hour before it would ignite the diesel. And then the powerhouse started up and the people had lights. I don't think they were 120 volts, I think something like 32. But they had electricity. And that made it quite different from the country areas even though there were villages with a fair population. Electricity made a great difference. In the country's areas there were very few cars in the '20s. 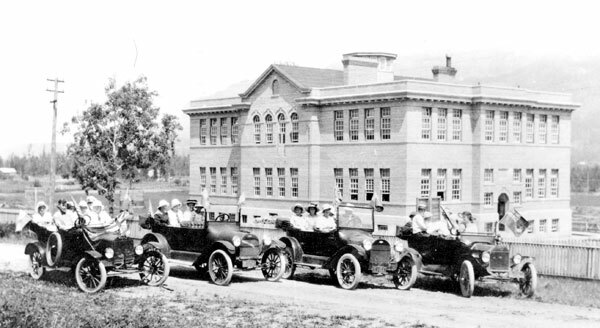 A few T-models, and a man by the name of Billy Crandlemire of Grindrod really amazed the whole district by buying a McLaughlin Buick. Beautiful big car, with brass on the front, big brass headlights on the side, and that was just about the best car we'd ever seen when I was a boy. We had no tractors, we had no milking machines, we had no washing machines, the scrub board was still in use. There was no bowling alley, no bus service for some years, there was no laundry mats, no indoor plumbing, no radio, no television, no air travel, but life was very peaceful, we had no rock bands either. Those were the main things that we didn't have. We did have some very valuable assets: we had the river, the Shuswap River. In the spring, we fished. It didn't cost us much, ten cents for a line, cheap. In the summer, we swam, we rode logs and telephone poles down the river, thought we had boats. In the fall, we speared salmon, not legally, but it happened. In the winter, we skated on it, because we had colder winters than we have now. 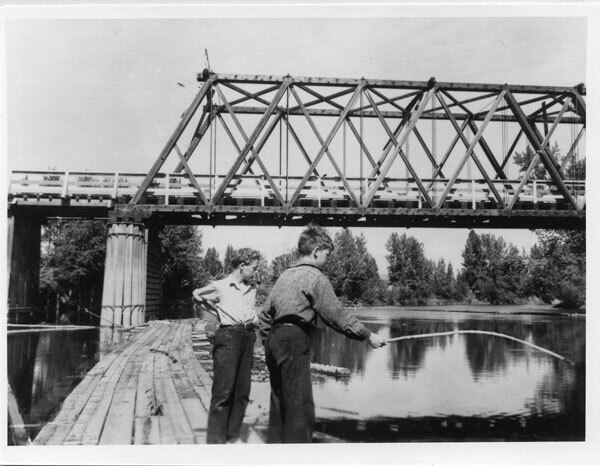 I can remember when the second bridge was built at Grindrod, the teams of horses were pulling up a two thousand pound pile driver and they were on the river ice, right over where the current is. But the ice was that thick. I don't think you've seen ice like that for the last few years. We had baseball teams, old Enderby. Enderby didn't have too good a baseball team. We had the Watkins brothers from Deep Creek, three of them. They were the best pitcher in the valley, the best catcher in the valley and a good outfielder, and we could always beat Enderby. Enderby had a good hockey team. They had the Jones boys, Sparrows, "Scoop" Robinson, I remember him because you would see him scoop from his end of the ice right up into the rafters, and the puck would bounce in front of the goalie, and he couldn't even see it amongst the rafters, it would bounce in front of him, sometimes it went in the net. So, he was called "Scoop" Robinson. They played in the Coy Cup several times. Played against Saskatchewan once that I remember. 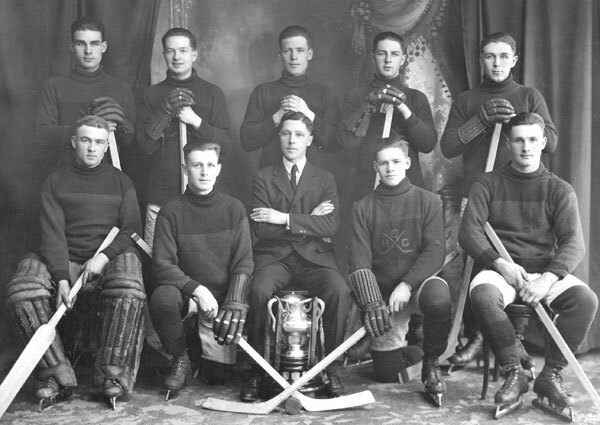 It was not unusual to drive from Grindrod on a night when it was below zero - heated up bricks, wrapped a blanket around them so they'd keep your feet warm, put some straw around you and would keep the wind out, and we could drive to Enderby to see a hockey game. We had movies every two weeks. A man by the name of Frank Treat from Revelstoke used to come through. 8mm camera, little narrow film, and it'd need five or six reels to the evening film, and when they changed films, there was an intermission. So he had four or five intermissions, at least. Of course, a reel seldom went through without breaking three or four times and he had to stop it and splice it. But it was real entertainment. Mostly cowboy pictures, I can remember Don Wells' father playing music to the galloping horses and so on. And we all sat down in the front, the boys, firing our cap guns as the outlaws were killing the sheriff's posse. And we had pranks. The people, for the most part, were hard working farmers, loggers, town merchants. There were three stores in Grindrod at that time, three grocery stores, and there was a pool hall, and there was a three room school which gradually went down to a two room school. There were teachers and there were nurses in the area. One doctor, Dr. Keith, served the whole country side. Enderby had a little more than that, they had a policeman. They had their own policeman, Bob Bailey, pretty burly looking chap. If he had a helmet on he would have seemed a London Bobby. But I happen to remember him because one of his famous arrests was my father. 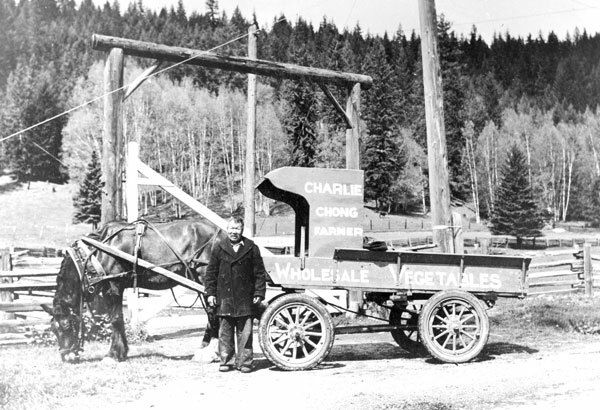 He got a criminal record for driving his team of horses more than eight miles an hour through the street of Enderby and Judge Barnes fined him $5 for his offence. Don't forget that $5 would be at least $50 now. And they had some characters. 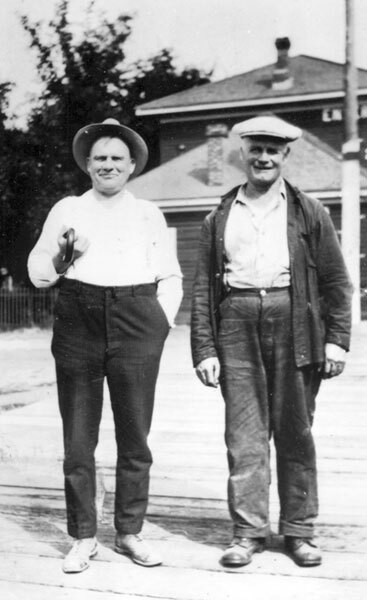 Although most of the people were hard working people and their pleasures were fairly simple, we had characters. Wild Bill was one. He lived about five miles out of town, and he used to drive a Democrat into Enderby on Saturday with whatever he could scrounge on his place to sell. It might be a few strawberries, it might be a quarter of a cord of wood, it might be a few bags of potatoes. Then he headed to the King Edward Hotel and he stayed there until midnight when the bar closed. And one night some of the young fellows got some flour sacks from the grocery store, and they shook the flour all over this dark horse that was tied at the hitch rack. When Wild Bill came out feeling no pain, he'd had a good night, his horse was not there. So he walked five miles home, on Sunday morning he walked back and his horse was still at the hitch rack, but it was white. We had a man that was known by everybody, Mr. Stevenson, who was stone blind, had been for years as the result of a hunting accident. And one of the things that happened to Mr. Stevenson was that when that hotel burned down, he had his room on the third floor, he came down the outside fire escape all by himself, and he'd been stone blind for years. He came down safely. He would dance all night at the dances. And he had a very good friend, an Irish gentleman by the name of Mr. Brown. And Mr. Brown had a wife who had a very sharp Irish wit. These two old gentlemen were great friends, and every morning they walked up to the post office, when the south train would come in with the mail, got the mail, and when they got back to the Brown place, Mrs. Brown was always out on the front porch, "What's the news today?" She loved the latest news. And, one morning, the two gentlemen came back and when they were unlatching the gate Mrs. Brown was out and said, "What's the news today?" And Hedley Stevenson said, "Didn't you here, Mrs. Brown? The devil died." "Oh!" she said, "You two poor orphans!" We had another character in Charlie Chong, the grocery man. He rented some twenty acres on our farm, grew a lot of groceries, and he used to deliver them with a horse and Democrat. And he was well known by everybody. Very kindly gentleman, he was everybody's friend. And he always gave something. He used to throw fifty cent pieces, you don't hear of them any more, into the river for us to dive for, that was quite a treat. It happened in Enderby that one of the churches had a campaign for funds to do some building or building renovation, and they asked Charlie for a donation. So he gave them ten dollars. And the next morning he came up to my father and he said, "White man Jeezy Cli no good. Yesteday me give him $10, and last night he fleezes all my tomato plants." We had a character who some of you know very well, Rolly Hill. I remember when they had Ice Carnival, they used to have a tug-o-war on ice. And Rolly's team always won, he was the anchor man on his team. His team always won. When he was in the dressing room one night taking his boots off, I saw that he had one inch shingle nails through the soles and heels of his boots. They were sticking in the ice, he could pull the whole team, he didn't need anybody else on the team. How did people live? Well, I've mentioned logging and farming and so on. But, a pretty standard wage at that time, whether you worked on a hay baler, or a thrashing machine or whether you picked apples, was two dollars a day for a ten hour day. Much of the farm produce was traded back and forth between people. People raised gardens. There was dairy farms, but a normal dairy farm would have ten or twelve cows because you had to milk by hand. And a good cream cheque would have amounted to about $60 a month, but your store bill would probably run $30 or $40. The rest of the food you either shot hunting or grew in the garden. But what about the changes? Changes began before the Depression was finished. Radio came in, and I can remember my brother-in-law having a radio and we'd get word that, "The radio was beautiful last night, we had a wonderful concert." So we'd go down to his place to hear the radio and hear this squeaking and squawking and there was nothing but static. Two days later, it was good again, but you weren't there. That was one of the first radios. But radio started, it was some time before we had 35mm movies, I think I was about 14 when the first "talkies" came in. I saw Charlie Chan in Vernon was absolutely enraptured by it because it was the first talking movie that I'd seen. Cars became more common, and cars made a great change. 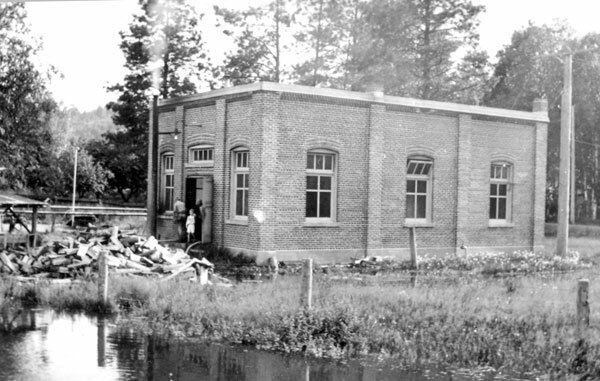 Grindrod went down from a three-room school to a two-room school, partly because many of the Ukrainian families had moved to Swan Lake and Vernon, partly because some people moved into town. The stores went from three grocery stores to one very small one. There was no longer a pool hall. They never built up the community hall again, they used the school auditorium. Mara, much the same thing happened. But, Salmon Arm grew. Vernon grew. They became the shopping centres because it was nothing to drive twelve miles to Salmon Arm or thirty miles to Vernon for a days shopping. Whether you saved money or not, it didn't matter, you had a day's outing. So, some places were dwarfed by the advent of the car, and some places grew because of it. But with the coming of rural electricity, big changes took place. Instead of the old battery radio, you could have electric operated radios. You had all kinds of electrical appliances, the scrub board became a museum piece and eventually you had laundromats. There was milking machines. No more hand milking, and so dairy herds grew as they cleared more land, and you had 50, 75, even 100 cows being milked instead of 10 or 12. You'd never get through 100 cows milking by hand. But what about those good old days? Well, in the good old days, we had cold houses, we didn't have insulation. We had a nice hot fire, you cooked on one side and froze on the other side in the winter time. You had poor lighting on the farms. You carried a lantern around on the side of a bucket of milk and the milk splashed on the lantern and then that cracks and the next morning it would be covered with brown paper. You didn't have much light after that. We didn't travel long distances. It was quite a trip to Enderby, Armstrong was a day's trip, and Vernon was almost out of reach. We had clay yards which got pretty dusty in the summer and got pretty wet and soggy in the winter. We had gravel roads which got either potholes or washboards or a good had both. This was the good old days that we talk about. But, strangely enough, very few people had debts. There were no credit cards. They might have borrowed money to build a house, but everything else they payed for. They didn't have much, but it was paid for. They certainly didn't have two cars, a boat and the type of house we have today. But there was peace, there was fun, there was neighbourly help. Building bees were quite the thing. Somebody had to have a barn built or a house built, everybody turned out. The women did the cooking and prepared beautiful meals, and they had a building bee. People tended to be experts. What a farmer couldn't do with a piece of bailing wire was rather surprising. He fixed the mowers, he fixed the side rake, and everything else with bailing wire. He had to. He did many of the operations that normally would be done by a veterinarian because the nearest veterinary was in Armstrong and had to come by buggy and it was expensive, it cost $10 or $15 to get the veterinary out, that was a lot of money. So the farmer was more or less an expert. So was a logger. He could sharpen his saws and so on, he didn't send them to a specialist. But today, we live in a day of specialists. And the difference between an expert and specialist is fairly simple. An expert knows something about a great many things. And as time goes on, he knows less and less about more and more until he knows nothing about everything. Whereas a specialist knows a great deal about very little, and as time goes on he's known more and more about less and less until he knows everything about nothing.